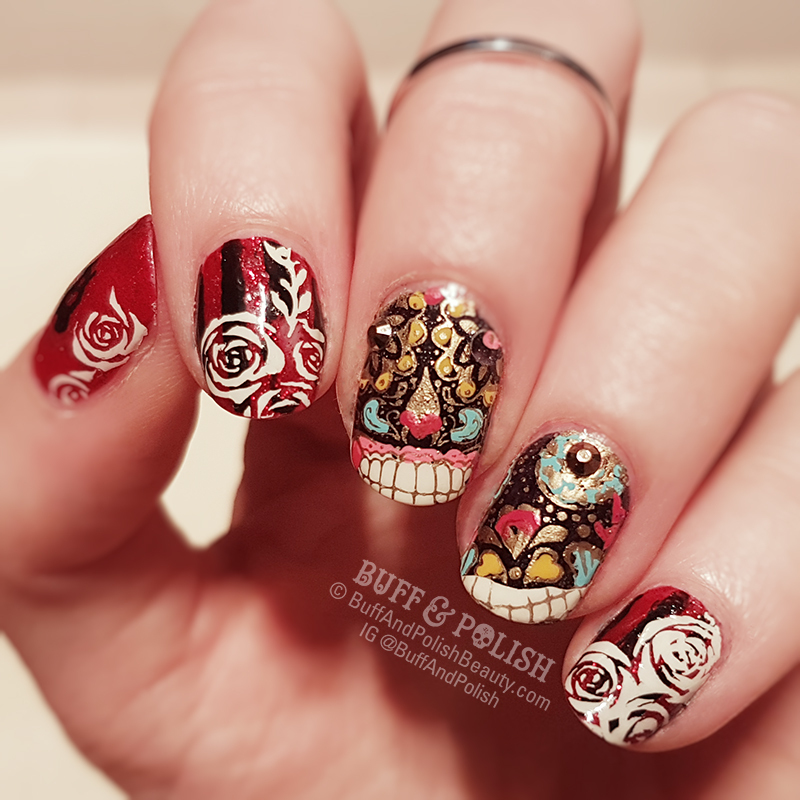 Sugar skull nails with red, black and white roses for Dia de los Muertos. Running behind as seems to be the norm for these past few months. Despite the planned shop opening and life in general being thrown in to turmoil, at least I got to do something for Day of the Dead. Not happy with it but at least it’s something… I miss doing negative space, but have to wait till those nasty breaks fully grow out (4 and counting…). Over the red glitter base (China Glaze) I created stripes using BM vinyls, and stamped off-white roses from a Hehe plate on top. 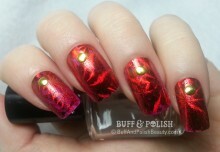 The skulls were reverse decals made on the UberChic Uber Matand stamped with gold metallic. I filled them in with a dotting too rather quickly using other Mundo de Uñas colours. The colour combo was part accidental as I was working in very low light, so I grabbed a hot pink instead of a more muted colour haha. Oops! 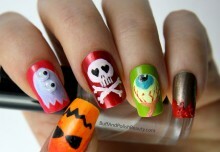 I added a few gold metallic Swarovski things for the eyes, and painted a cat skull on my thumb. Not that you can see it in the first shot. Maybe I have a macro someplace…? I haven’t done any challenges (let alone any nails) in recent times, so this is part of the #NailPolishSocietyABC challenge for the 4th November. The letter is V for Vinyl, which I why I used vinyl stencils in the stripes.